Simply put, the Chilean M-60 Sherman is a ‘modification of a modification’ of one of the most versatile tanks ever built, the American M4 Sherman. These Shermans had already been owned, upgraded and operated by the Israelis, who then sold them to Chile in the early 1980s. Chile bought 65 of these tanks, who in turn, requested that they be modified once more. This modification included the replacement of the main gun with a 60 mm (2.3 in) High-Velocity main gun, and a new Detroit Diesel engine. By 1983, the M4 Sherman had been in active service with one country or another for 41 years. 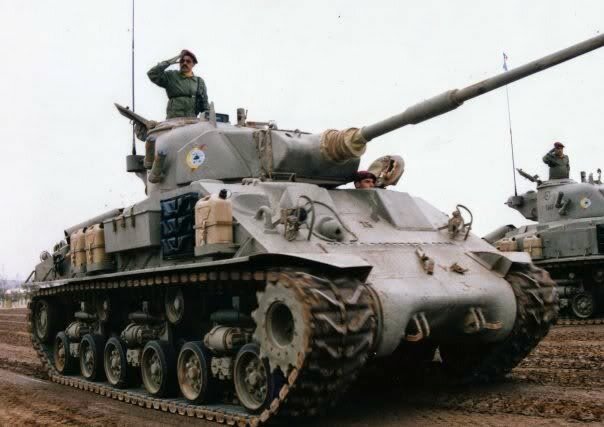 The Chilean Army (Spanish: Ejército de Chile) was about to extend this life further, only retiring their M-60 Shermans between 1999 and 2003. The 16 years of service the M-60 saw in Chile made it one of the last operational weaponized Sherman tanks to actively serve in any of the World’s militaries. The M-60s served alongside the far more modern French AMX-30, of which 21 were purchased in the early-1980s. The Shermans were replaced by the German Leopard 1V, in 1999. Chile is a long, thin country located on the west coast of South America, with the Andes mountain range forming its eastern border. The country has seen a number of internal conflicts throughout its history. The last major conflict Chile fought was against Peru and Bolivia in what is known as the War of the Pacific (1879-1883). This resulted in a Chilean victory, but tensions between the three countries survive to this day. Chile has not taken part in any major international war in the 20th or 21st Centuries. In World War 2, Chile’s hesitation at declaring war on the Axis did not please the United States, who were pressuring the Latin American Countries to do just that. In 1943, Chile only broke diplomatic connections with Germany. It was not until 1945 that Chile would declare war on Japan as part of an agreement between the US and Chilean Governments. Diplomatic repercussions caused by the fact that Chile did not declare war on Germany resulted in reduced support from the US in the post-war years. Chile has maintained a very tense relationship with its neighbors, especially Argentina. However, it has taken – and does still take – part in a number of United Nations Peacekeeping missions across the globe. These included the United Nations Peacekeeping Force in Cyprus (UNFICYP, 1964-2013) and United Nations Interim Force in Lebanon (UNIFIL, 1978-13). Throughout its history, the Chilean Army has been supplied by various countries, such as Israel, the United States, Germany, the Netherlands, Switzerland, France, and Spain. The M-60 variant was not the first type of Sherman to be employed by the Chilean Army. In 1947, following the signing of the Rio Treaty (Officially the ‘Inter-American Treaty of Reciprocal Assistance) the United States supplied Chile with 30 M4A1 Shermans. This treaty, still in effect to this day, was signed in Rio de Janeiro, Brazil, by multiple countries in the Americas. In a similar line to NATO, the principal article of the organization is that an attack against one is to be considered an attack against them all. Chile then acquired a further 46 from commercial sources. In 1948, this Sherman force was bolstered further by the arrival of 48 M4A1E9 Shermans, again supplied by the USA. The E9 was a modified M4A1 which saw an addition of a spacer set between the hull and bogies of the Vertical Volute Spring Suspension (VVSS). There was another spacer on the drive sprocket. The spacers allowed the addition extended end connectors to be fitted on both sides of the track, giving it a wider track. The E9 was supplied to many friendly countries of the USA after the Second World War. Other upgrades included the addition of the newer vision cupola for the commander and a new hatch for the loader. The tank retained the standard 75mm M3 gun. They remained in service with the Chilean Army into the mid-1970s. By the time the Chilean Army got hold of their M-60 Shermans, the tanks had already changed hands at least two times during their existence, making the South American buyers the third owners of these specific tanks. Originally, of course, the Sherman was an American tank which entered service with the Allies in 1941. During the Second World War, the M4 was used by the British, Soviet, French, Chinese and many other Allied nations. They also continued to serve with numerous countries after the war had ended. In the late 1940s, Israel found itself in need of tanks but was unable to purchase any directly, so instead, started scouring the scrapyards of Europe and acquired demilitarised Shermans which they brought back into service, ironically some of which had German guns. Over the next 20 or so years, this hodgepodge of all varieties of Sherman – from M4 to M4A4 – went through several upgrade programs. In the early 1950s, with help from the French Military, a program began with the intent to upgrade their M4s. This included the addition of the 75mm SA 50 gun, as used on the AMX-13 light tank, which led to them being renamed the M-50 Sherman. In the 1960s, the tanks were upgraded once more to fit the 105 mm Modèle F1 gun. These upgrades received the M-51 designation and are often incorrectly called the ‘Super Sherman’ or ‘Isherman’. Along with this gun, all tanks were given a mobility improvement with the addition of the Horizontal Volute Spring Suspension (HVSS) system and the Cummins V-8 460 horsepower diesel engine. By the early 1970s, the 75 mm armed M-50s were being phased out. The 105mm armed M-51 would stay in service until the early 1980s. Once retired, Israel chose to sell them. The Republic of Chile would purchase a mix of around 100 M-50 and M-51 Shermans from 1983 onwards. A few of the purchased M-50s had previously had their 75 mm guns removed when they were retired, however, Israel offered to install a 60 mm Gun developed by OTO-Melara of Italy and Israeli Military Industries (IMI) instead. Twenty-seven of these tanks were dispatched to Chile in 1988. The 27 tanks arrived and were disembarked at Iquique, a port city in Northern Chile. 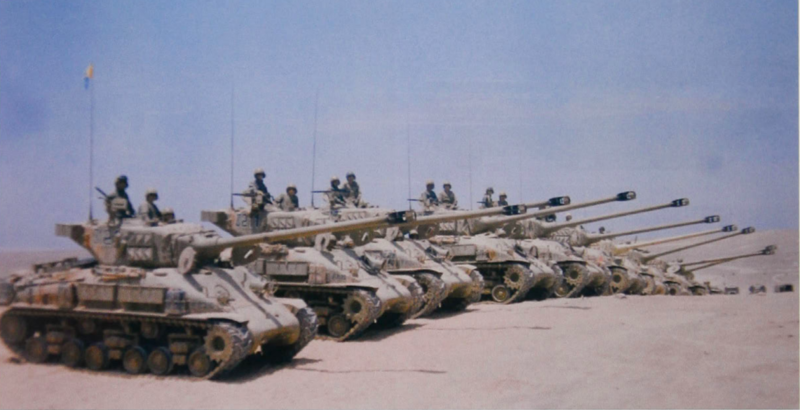 The first of these newly armed tanks were placed in service with the 9th Armored Cavalry Regiment ‘Vencedores’ (Triumphant). More of these modified Shermans would arrive in Chile throughout the following years. It is thought that as many as 65 Shermans were upgraded to this standard. These 60 mm-armed Shermans were known by a few different names. The most popular of these is the ‘M-60’. The Chilean Army christened it ‘M-60’ after the 60 mm gun. However, it is also known as the ‘M-50/60mm’ or ‘M-50 (HVMS)’. It is reasonable to suggest that one of the reasons the Chilean Army decided to purchase the Israeli Shermans was the fact that they had already gained experience in operating and maintaining Sherman tanks. This is the author’s own opinion, however. Also, in 1976, the United States had placed an arms embargo on Chile, which barred the sale and import of weapons which lasted until 1989. 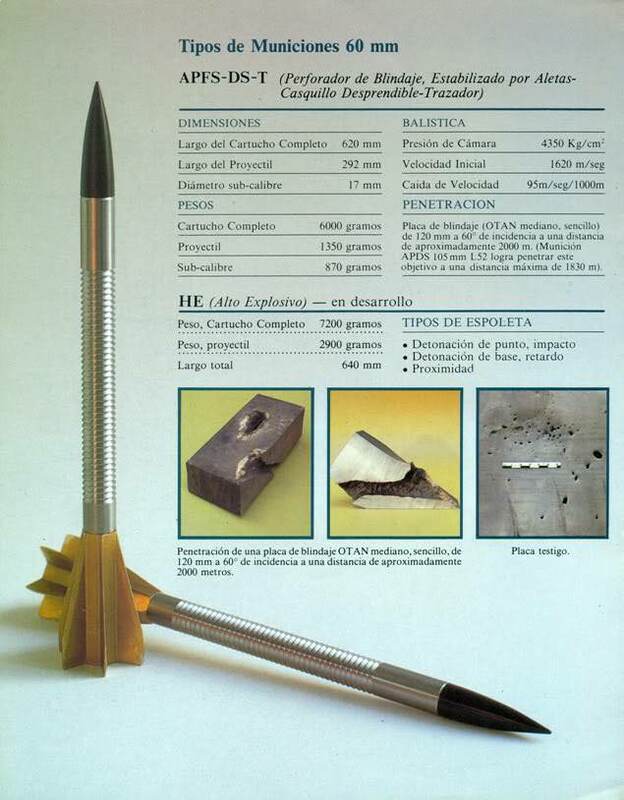 Furthermore, the French government had vetoed the sale of more weapons to Chile in 1981. This meant that the market for a new tank was restricted and Chile had to do with an obsolete tank. The two identifying features of the Chilean M-60 Sherman are the 60mm gun and the modified engine deck. It is these modifications that will be focussed on in this section. There were other, smaller additions though, such as an Israeli-style stowage bin on the engine deck overhanging the rear of the vehicle or an air deflector which was also added below the overhang to deflect heat away from the stowage bin. A new folding travel lock compatible with the 60mm barrel was also added to the rear of the engine deck. Officially, the weapon is known as the 60 mm High-Velocity Medium Support (HVMS) Gun. It was a joint development started in the late 1970s between Israeli Military Industries (IMI) and OTO-Melara of Italy. The 60 mm (2.3 in) gun was designed for infantry support, the idea being to give infantry units increased anti-armor firepower by giving them a powerful, but light gun that could be mounted on light vehicles. A joint project to develop a lightweight turret housing the gun, which could be mounted directly onto light vehicles, such as the M113 APC, was planned, but this did not come to fruition. The two companies split during the project, developing their own versions. Despite being a success, the weapons did not enter service with either the Italians or the Israelis. The gun had a barrel length of 70 Calibers (4.2 meters), with a fume-extractor placed halfway down its length. The barrel was constructed using the autofrettage method of metal fabrication. In short, this allowed the barrel wall to be thin, but extremely tough. The gun utilized a hydrospring recoil system, meaning the spring surrounds the breach-end of the barrel, protected by a shroud. It is further protected from the elements by a truncated rubber – or possibly canvas – sleeve. The hydrospring system allows quick barrel changes as the gun and recoil system can be removed/installed as one unit. The gun has the feature of being both manually and automatically loaded. Manually consists of the traditional method of sliding the shells into the vertically-sliding breach by hand, though, in this case, there is hydraulic assistance. The automatic method consists of a vertical magazine with a three-round capacity loaded in a similar way to Bofors’ automatic guns. This system is recoil-operated with a shell-to-shell reload of three seconds. These could be fired one-by-one, although there was also the option of firing a three-round burst. By all accounts, it would appear that the Chileans primarily used the automatic firing mode. The weapon was equipped with both High-Explosive (HE) and Armor-Piercing Fin-Stabilized Discarding-Sabot, Tracer (APFSDS-T) rounds. Both rounds were produced by OTO-Melara. In Israeli tests, the gun proved to be precise at over 2,500 m. The APFSDS projectile flew at an initial speed of 1,600 meters-per-second and was able to penetrate the side armor (15 – 79 mm thick) of two T-62’s, side-by-side, at 2,000 m. At maximum, the dart could penetrate 120 mm of armor, angled at 60 Degrees, at a distance of 2,000 m.
The 60 mm guns were delivered separately from the tanks. Chilean Military Industries were given the task of installing the guns in the tanks, which involved modifying the existing mantlets to accept the new guns. The installation process and modifications were developed by the Israeli based NIMDA Co. Ltd. Apart from the installation of the appropriate gunnery and sighting systems, and new ammunition racks for the 60 mm rounds, very little modifications to the turret were needed. The Sherman was not the only tank upgraded with this weapon. The Chilean Army also had a number of their older M24 Chaffee tanks adapted to carry the gun. The other major upgrade to the M-50s came in the form of a new engine. The old Cummins V-8 460 hp diesel engines were worn out, and a replacement was required. The chosen replacement was the more powerful 535 hp V-8 Detroit Diesel 8V-71T engine. The introduction of this engine required some modification to the engine deck. On M4 tanks, the exhaust vents out of the rear of the tank, between the idler wheels. On the M-60 version, the exhaust vented out of the top of the deck. A hole had to be cut in the top of the engine deck, on the right side of the hull, near the air intakes. The exhaust pipe extended from the hole, down on to the upper portion of the sponsons. Additionally, a protective cowling was welded over it. The Israeli-added armor over the air intake was kept in place to protect the exhaust where it emerged from the deck. The tensions between Chile and Peru never subsided after the Pacific War of 1879-83. In the late 20th Century, when the M-60s entered service, tensions were at their highest between Chile and their northern neighbor. There was a fear that the two countries would once more fall into conflict. 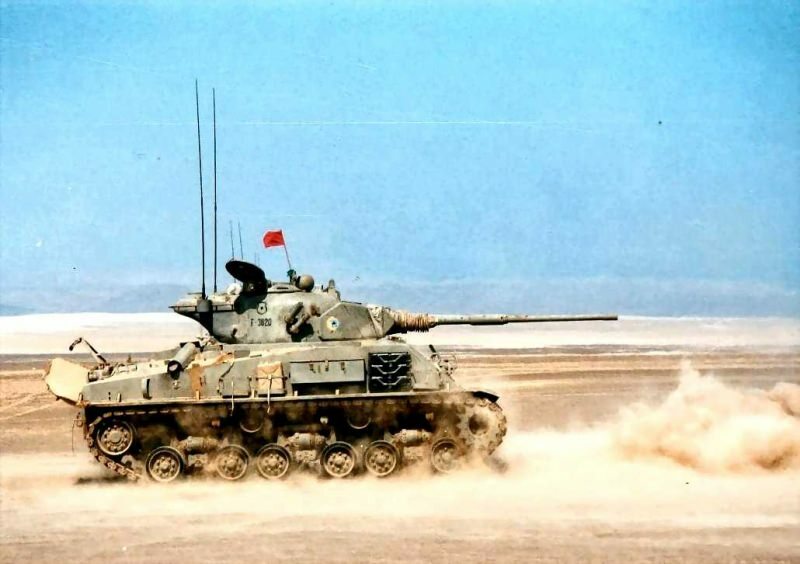 The Chilean Army had great faith that their M-60s, and indeed their M-51s of which they retained over 100, would be able to combat the Peruvian, Soviet-origin T-55s. Although both sides prepared for it, a war never materialized. The M-60s would continue to serve past this point, complemented by the M-51s, 60mm-upgraded M24 Chaffees, and even a few French AMX-30s which were purchased in the early 1980s. In the late 1990s, Chile began to receive German Leopard 1Vs, supplied by the Netherlands between 1999 and 2000 and a few more AMX-30s. With this, the M-60s and M-51s became redundant. They were finally removed from service between 1999 and 2003. This made them some of the last operational weaponized Shermans in any military in the world, bringing the total service life of the M4 Sherman to approximately 60 years. Although the tanks were retired, it appears that the guns continued to serve. Despite the fact there does not seem to be any currently available photos, some of the guns were reportedly mounted on Chilean license-built MOWAG Piranha I 8x8s. While most of the Shermans ended up as range targets, at least one survives as a museum piece. 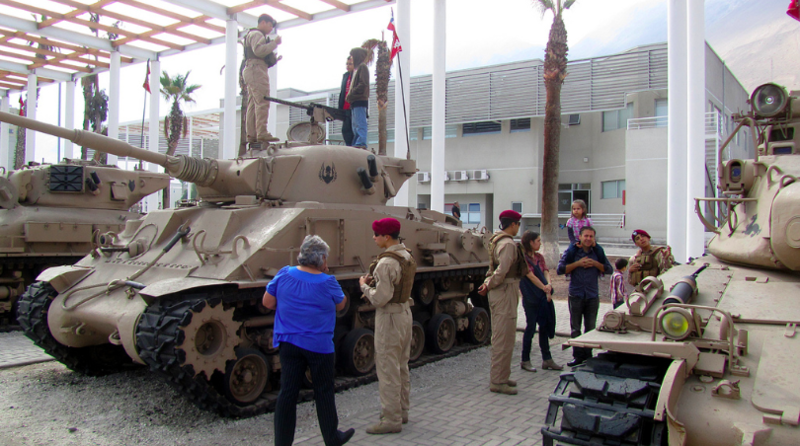 This tank can be found in the Museo de Tanques del Arma Caballeria Blindada in Iquique. Those Sherman tanks should have been spared and put up for sale on eBay. World War Two reenactors could have easily reconditioned them to reenact World War Two or to appear in such movies as “Saving Private Ryan” and “Saints and Soldiers”. These tanks made their mark in Chilean armored history because it was perhaps the only time the Chilean army adopted armament that was so unique, never being very innovative. The Chilean armed forces traditionally prefer well-proven concepts and technologies. The IMI 60mm gun had several advantages. Their very high speed made for a very tense trajectory and was very precise, simplifying aiming. I believe the three-round clips weren’t used on the M-24 Chaffee due to the reduced space in the turret. 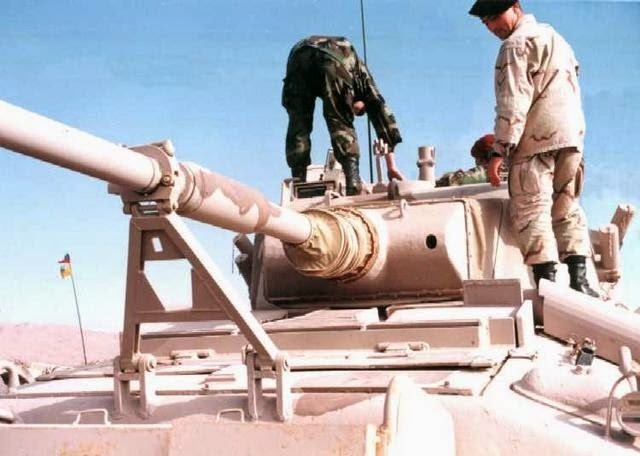 The Israelis had plenty of captured Syrian and Egyptian tanks and hulks to test and improve the gun and I’ve heard and read some accounts that the APFSDS darts could easily perforate the glacis and turret front of a T-55 without much trouble up to 1.000-1.500 meters. I believe the guns were withdrawn from service, not because they weren’t any good, but because sourcing ammunition was very difficult, since the darts were not produced locally; that made them expensive, and with plenty of 105mm and 120mm guns on the Leopard I and II now at hand, they simply became redundant. I believe that the 60mm gun could find a bit of a resurgence in anti-aircraft batteries; yes, guns are not as common as before, but once fired, they can’t be jammed like a missile, and having greater range and precision than the 35mm commonly used, and a far bigger punch; and 60mm rounds could lend themselves to becoming guided gun rounds like OTO-Melara DART rounds, something that (as yet) cannot be done in 35mm. I remember reading that there were projects to install the ubiquitous OTO-Melara 76mm gun on tank chassis to make them anti-aircraft platforms. Although formidable, they could carry too few rounds of ammo to make them effective. Maybe the 60mm gun which derives from it could hold the answer, since it would be able to carry far more rounds in such a vehicle, and would be dual-purpose; anti-armour, support gun, and anti-aircraft. El Articulo contiene un error, dice que en 1943 Chile le declaro la Guerra a los paises del EJE, lo cual no es cierto, despues de la presion de EEUU a los paises latinoamericanos para que entrasen en guerra contra el EJE, Chile se nego a declar la guerra a Alemania, solo rompio relaciones diplomaticas, en 1945, un par de meses antes que cayera Alemania, despues de las multiples amenazas de EEUU, el presidente chileno mando a preguintar si declarando la guerra a Japon bastaba, los EEUU dijeron que si , asi que Chile le declaro la guerra a Japon el 12 de abril de 1945. El no declar la guerra a Alemania trajo para Chile “el ambargo” de EEUU, mientras a Brasil y Argentina que si declaraon la guerra a Alemania le entregaron 400 tanques de ayuda tras la guerra…a Chile solo 17 Sherman. Muchas gracias, el error ha sido corregido. Are you going to do an article on the Chaffee version carrying the 60mm? We will, but it is not in the works right now.